Between getting ready for next week's move and the heat wave we're experiencing, my mind is as jumbled as this photo. The days have been hectic and I seem to end the day in a blur. So I thought I'd share some random thoughts, photos and recipes. BUT... no time or energy for the whole affair...not to mention no BBQ. So I didn't do the delicious looking citrus-cucumber relish or actually tea smoke the salmon. What I did manage was to marinate the salmon (and some extra large shrimp) as directed - 1/4 cup Chinese dark soy sauce, 1 tbsp granulated sugar, 1 tsp finely grated orange zest, 1/2 tsp crushed red pepper flakes. I let the salmon marinate for about 20 minutes and quickly pan grilled them. 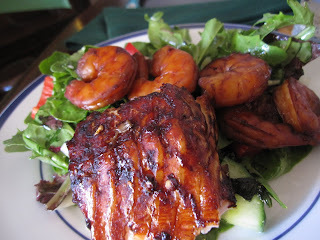 When the salmon was grilling, I placed the shrimp in the marinade and as soon as the salmon was done (about 15 minutes), I grilled them too. Served over a simple mixed green salad tossed with a little apple cider vinegar and sesame seed oil. Dessert was both simple and simply delicious. 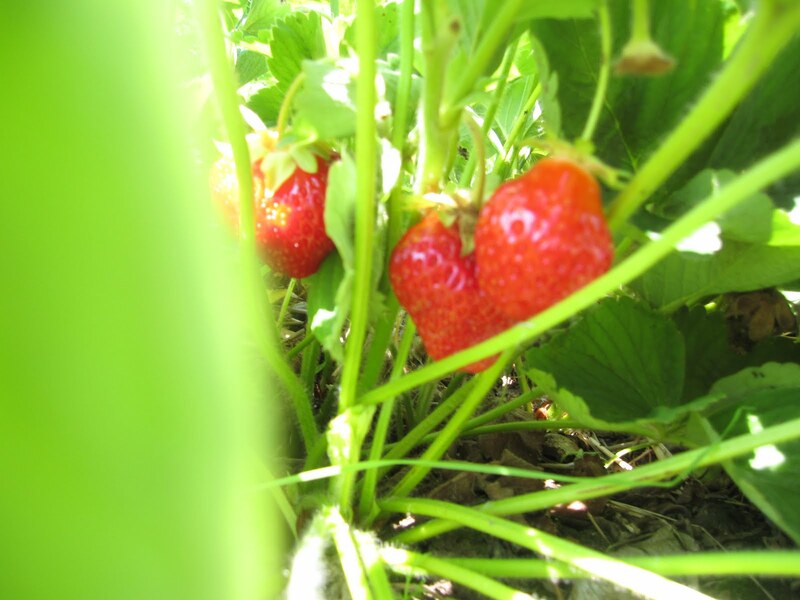 I love it when nature does all the work...strawberries (maybe the last of the season) and blueberries (definitely the first of the season), sprinkled with a tsp of granulated sugar...just enough to get the juices flowing. 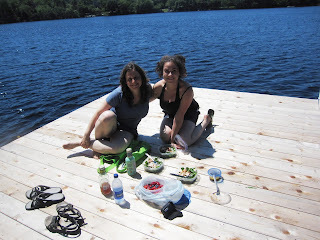 And what could be more perfect on a hot, sunny summer's day than playing hooky from packing and spending it on the brand new dock at Joanna (Sharron's big sister) & Ezra's with Sharron and her friend Jasmine with a picnic lunch of leftover salmon turned into a magical salad made with fresh peppery arugula and other salad greens from Jasmine's garden and some Ran-Cher Acres Cayenne & Garlic seasoned goat cheese. 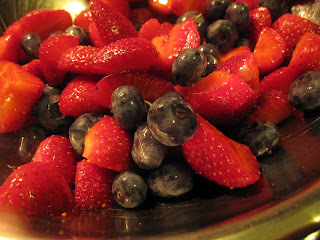 Not to mention, the last of the strawberries & blueberries for dessert. And more fun in the sun...we went strawberry picking with Boaz, Dov, Ezra (aka Daddy) and Sharron on Sunday. 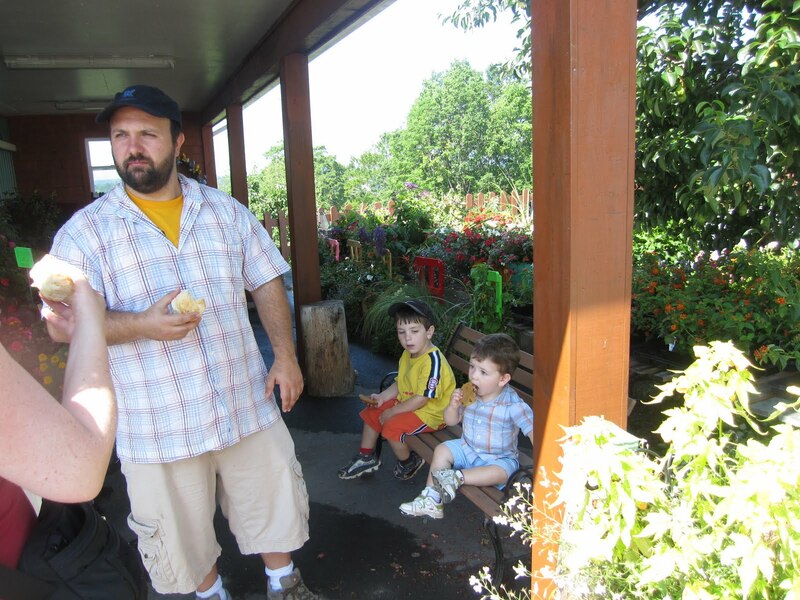 That's daddy & the boys munching a little snack of homemade biscuits and cookies at Indian Garden Farms - a wonderful find for u-picking strawberries & raspberries. They were just bringing in their own green peppers to their on-site market (still warm from the field and sun) while the boys and I were identifying all the fresh produce. Dov did insist that the tomatoes were apples. Wait until he gets to pick some real apples in another month or so. 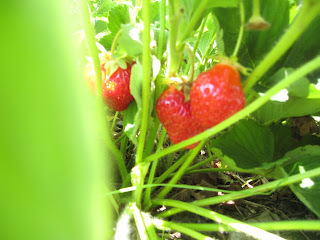 It is the end of the season so the strawberries were not that plentiful. 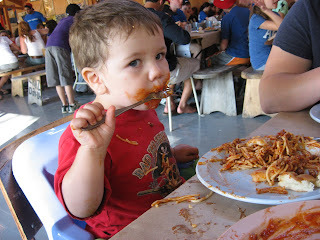 Dov was our taste tester and he thought they were awesome. We think he ate his weight in berries. That's Dov digging into a plate of spaghetti at Camp Kadimah, just reminding everyone that Presto Pasta Night is just around the corner. Don't forget to share your entries with Janet of The Taste Space, this week's wonderful host. 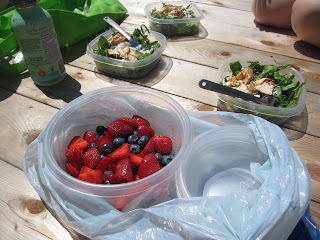 Just send your link to saveur11 (at) yahoo (dot) ca with a cc to me - ruth (at) 4 everykitchen (dot) com. I just roasted a chicken (started at 7:30 am to avoid the heat that is sure to melt me later. I'm hoping to make a pasta with chicken, fresh rosemary, some mushrooms and a dash of white wine. I'm even going to cheat a little and boil up the pasta now so I only have to do a quick reheat at dinner time. And now it's back to packing! 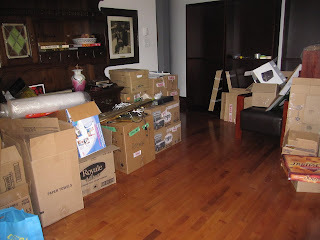 it all looks like such fun - I'd never have guessed you were packing and moving! good luck with it all, hope you're moving into a fabulous kitchen! Thanks Kirsten...and the kitchen is wonderful. I can't wait to start cooking in it. Look for lots of pictures. The best part of moving is the unpacking Ruth. I know you'll love the new place. That's my favourite kind of dessert! There's nothing so wonderful ripe fresh fruit on a hot summer night. Looks wonderful. Great reading your post as well.